JACKSON CENTER — Fort Loramie took a 23-point lead by the end of the first quarter and didn’t look back in a 66-10 road Shelby County Athletic League victory over Jackson Center on Thursday. Marissa Meiring led the Tigers with 14 points and six rebounds and had three steals. Dana Rose, Taylor Ratermann and Kennedi Gephart each scored eight points. Kenzie Hoelscher added five points, brought down five rebounds and had five steals. The Redskins, which are ranked No. 1 in the Associated Press state Div. IV poll, shot 21 for 50 (42 percent) from the field. Raquel Kessler led the Tigers with six points. Jackson Center shot 3 for 20 (15 percent) from the field. A showdown between MAC neighbors and rivals Minster and New Bremen quickly turned into a blowout on Thursday. The Wildcats, which are the No. 2 ranked team in D-IV, led 21-3 at the end of the first quarter and cruised to a big victory. Ivy Wolf led Minster with 18 points while Demaris Wolf scored 11. Kelly Naylor led New Bremen with nine points. 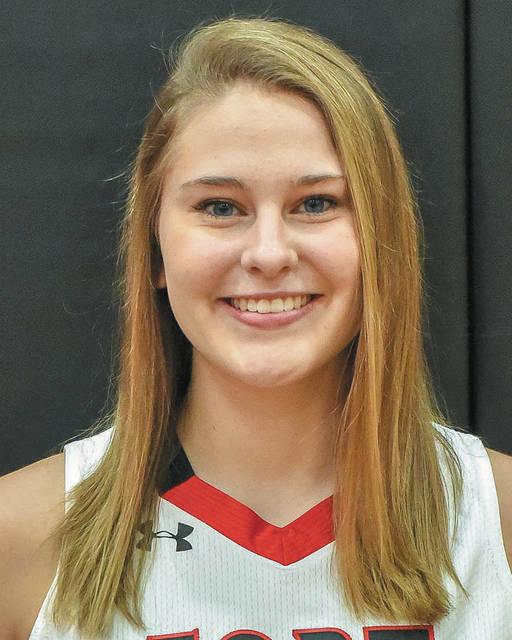 After a tight first half, Riverside pulled ahead in the third quarter and pulled away in the fourth to earn a Northwest Central Conference victory on Thursday in De Graff. The Pirates led 12-8 at the end of the first quarter but the Tigers battled back to tie it 18-18 at halftime. Riverside used an 18-12 scoring advantage in the third quarter to take the lead and then finished with a 14-8 scoring advantage in the fourth. Dana Jones led Riverside with 18 points while Shelby Giles scored 14. The Pirates shot 16 for 49 (32 percent) from the field and 12 for 28 (42.9 percent) from the free-throw line. Hodge said one of the keys to the victory was Alli Knight taking four charges on defense.